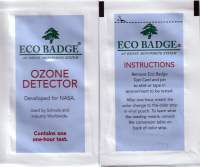 The Eco Badge ozone test cards are a low cost way of testing the ozone levels you are exposing yourself to. 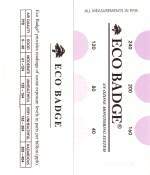 They have a test range from 0.04 ppm (40 ppb) up to 0.240 ppm (240 ppb). They work very similar to litmus paper used for testing the ph of a fish tank, pool, spa, etc. You open the Eco tester pouch, pull out the test card and mark down the time, one hour later you simply compare the color on the test card to the color chart. If the color on the card is closest to the 80 mark then you have exposed the card to an average of about 0.080 ppm of ozone.